In late 1897 Pissarro began a series of 15 pictures of views from the Grand Hotel du Louvre in Paris, showing various scenes of the Place du Theatre Francais, the Avenue de l'Opera and the rue St Honore, and he finished the series in the spring of 1898. The year 1897 had been traumatic for him: his son Lucien had had a stroke and worse still, in November 1897 another son, Felix, had died of tuberculosis at the age of 23. The artist was also suffering from a recurrent eye infection, which had dogged him since 1889. Politically the years 1897/8 were especially unstable due to the Dreyfus affair, which had a particular relevance to Pissarro as, like Dreyfus, he was Jewish. The affair bitterly divided the Impressionists: Degas, for example, became fiercely anti-semitic and so his relationship with Pissarro suffered. Pissarro's response to all these events was to wrap himself up in his work and, though very politically minded, he seems to have kept his art and politics separate in these paintings. 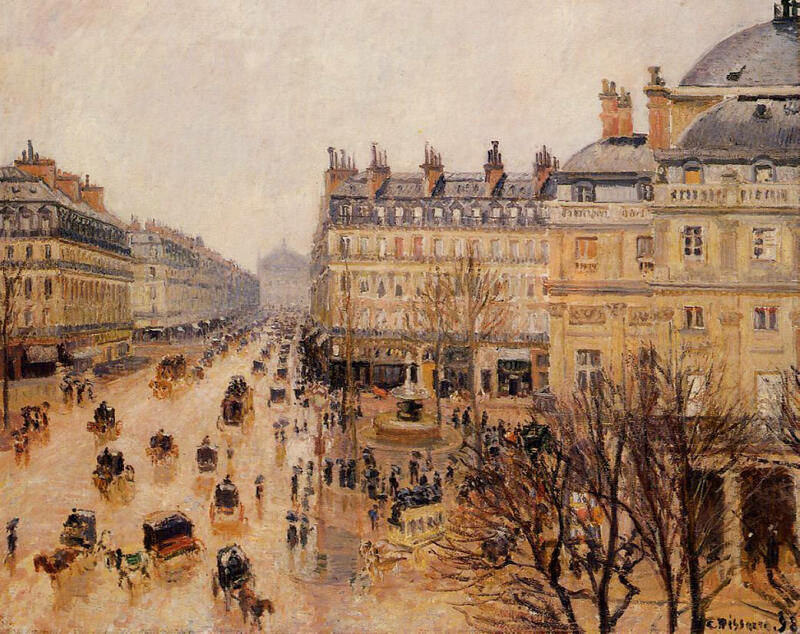 In the letter he wrote, to Lucien, telling him of Felix's death, Pissarro mentions his new subject: "I am delighted to be able to try to do these Paris streets, which are so often called ugly, but which are so silvery, so luminous and so lively". In this work the circular Place du Theatre Francais is in the foreground, from which the Avenue de l'Opera branches off into the distance, Charles Garnier's opera house being visible at the very end, enveloped in a haze. This area of the city was filled with high-class shops and was the heart of consumerism in the capital. Here, as mentioned in his letter, he depicted the 'silvery' streets wet with rain. In contrast to the Boulevard Montmartre series of the previous year, these works presented Pissarro with a much more rectilinear composition, dominated by distant views in plunging perspective. Furthermore, there are the additional circular elements of both the Place du Theatre Francais itself and the pedestrian islands with their fountains. Pissarro thought this series a great success, and it was exhibited in its entirety at the Durand-Ruel galleries in June 1898.